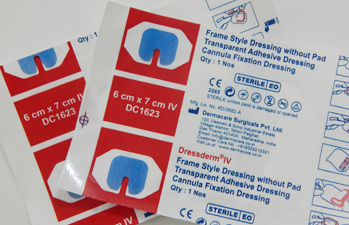 Supple, elastic polyurethane film that is similar to skin, extremely fine and transparent for post-operative wound care, for superficial wounds with light discharge also for protecting the newly formed epithelial tissue in wounds that are kept in a moist environment untill fully healed, eg. leg ulcers in their repair phase. The dressing can be worn for a prolonged period, due to its reliable adhesion and skin tolerance. The extremely thin membrance prevents germs from entering the wound inhibiting the release of water vapour from the skin. 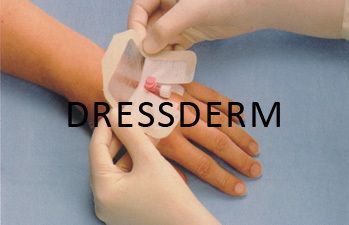 DRESSDERM protects the wound, enables movement, kinotherapeutic baths, bathing or showering. The wound can be checked visually at any time, even when cannulas, infusion catheters of drains are attached. 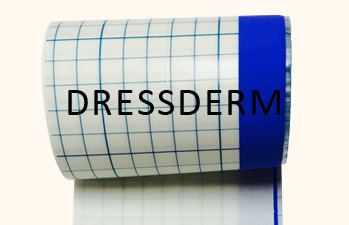 DRESSDERM Transparent Dressing sterile for postoperative dressing of superficial, slightly exudating wounds, especially for the protection of the fresh epithelium, for wounds which are kept in a moist environment untill they are healed, eg. leg ulcers during the repair phase. Film Dressing of the Roll is to support the prophylaxis against decuital ulcers, agianst maceration of surrounding skin, and the retention of wound dressing, tubes, etc.